Toyota-brand cars, trucks and crossovers possess a stellar reputation for quality, style, performance, capability, technology and affordability. With so many options for Bangor-area car shoppers at Downeast Toyota, many families want to know – what are the differences? Take a closer look at two popular Toyota crossovers in this 2019 Toyota RAV4 vs 2019 Toyota 4Runner comparison. A complete redesign has made the 2019 Toyota RAV4 more attractive, more athletic and more advanced than ever and it will be available in five grades – LE, XLE, XLE Premium, Adventure and Limited – that are tailor-made for family adventures with a versatile design. Add a fuel-efficient and fun-to-drive Toyota RAV4 Hybrid to the equation and the Toyota compact crossover is a fan favorite. Families who love mud-slingin' adventures will love the rugged, family-friendly 2019 Toyota 4Runner, which is available in seven grades – SR5, SR5 Premium, TRD Off-Road, TRD Off-Road Premium, Limited, Limited Nightshade Edition and TRD Pro – that are available in five- and seven-passenger configurations. Families in search of a Toyota-brand crossover SUV will find the right fit in this 2019 Toyota RAV4 vs 2019 Toyota 4Runner debate. With a price tag that starts at $25,500, the 2019 Toyota RAV4 promises value at every turn with a revolutionary list of standard features and amenities. Geared toward an audience that loves to take the road less traveled, the 2019 Toyota 4Runner will start at just $35,110 and deliver tremendous, trail-ready power. The 2019 Toyota RAV4 is a versatile compact crossover with room for five passengers and 37.6 cubic feet of cargo space behind the rear seats – perfect for trips to the grocery store. 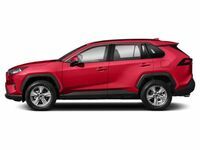 Highlights of the entry-level Toyota RAV4 LE spec sheet include 17-inch wheels, LED headlights, a rearview camera, Toyota Safety Sense™ 2.0 safety systems and a 7-inch Toyota Entune™ 3.0 touchscreen infotainment system with access to Apple CarPlay, Bluetooth and Wi-Fi Connect. Available upgrades to the Toyota RAV4 resumé include a Toyota SofTex® interior, an 8-inch Toyota Entune™ 3.0 touchscreen, a panoramic sunroof, a JBL® premium sound system, a wireless charging system and more. Embark on a Toyota-brand adventure when you get behind the wheel of the 2019 Toyota 4Runner at Downeast Toyota. Toyota 4Runner entries make room for five passengers in standard configurations with 47.2 cubic feet of cargo space behind the rear seats and will add third-row seating to make room for seven occupants with 9 cubic feet of cargo space behind the third row. Base Toyota 4Runner trim levels employ 17-inch wheels, skid plates, a rearview camera, a leather-wrapped steering wheel, a 120-volt power outlet in the rear and a 6.1-inch Toyota Entune™ touchscreen infotainment system. Optional upgrades include 20-inch wheels, Toyota SofTex® interior, a 15-speaker JBL® sound system, heated and cooled front seats and premium leather upholstery. Power and performance are hallmarks of this Toyota RAV4 vs Toyota 4Runner comparison. 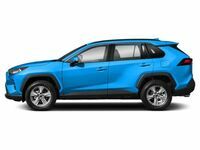 Toyota RAV4 entries employ a 203-horsepower 2.5-liter Dynamic Force four-cylinder engine married to an eight-speed automatic transmission that will earn 26 mpg in the city and 35 mpg on the highway. To upgrade performance, the Toyota RAV4 can be equipped with a revolutionary Dynamic Torque Vectoring AWD system with Rear Driveline Disconnect. Trail-rated Toyota 4Runner models feature a 270-horsepower 4.0-liter V-6 engine that is paired with a five-speed automatic transmission and is available with rear-wheel drive and four-wheel drive. Visit Downeast Toyota today to find the Toyota car, truck or crossover that is the right fit in Bangor!